The Maag brands “Maag Pump Systems” and “Automatik Pelletizing Systems” will show an extrex 90 extrusion pump as well as the CSC 116-RS arched screen changer at its booth W5945 at this year’s NPE show in Orlando, Florida/USA. PSG Automatik’s SPHERO® Underwater Pelletizer wins new award. Großostheim, 11 August 2014 – At the FAKUMA 2014, the PSG brands "maag pump systems", "automatik pelletizing systems" and "maag filtration systems" will be presenting a complete system for polymer production in the mid-tier throughput range. 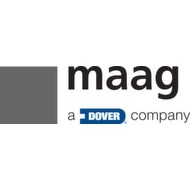 Oberglatt, Switzerland, April 4, 2014 – Maag Automatik (a Dover Corporation Member) is proud to announce that M&G Finanziaria (Italy) has chosen the German manufacturer to supply the equipment needed for a complete PET pelletizing plant. Automatik Plastics Machinery was able to sell the first three units of its new Primo 200 E strand pelletizer to Austrian master batch manufacturer Gabriel-Chemie.